Celebrate California’s newly designated Wild and Scenic River, with Laurie Lewis and the Right Hands at the historic Mokelumne Hill Town Hall on Friday, November 16th at 7:30 p.m. The event is a special Earth Day celebration to benefit Mokelumne River conservation and the Foothill Conservancy. Tickets are on sale now: Adult tickets are $35 advance, $40 door; tickets for kids 12 and under are $15. Advance tickets can be purchased online from Brown Paper Tickets at https://www.brownpapertickets.com/event/3625195 or in Jackson from the Foothill Conservancy. Refreshments, including wine and beer, will be on sale at the event. For more information, please contact Foothill Conservancy’s Carolyn at 209-223-3508 or carolyn@foothillconservancy.org. “We’re really excited to have Laurie return to Calaveras with her band,” said Foothill Conservancy Executive Director Amanda Nelson “Laurie’s a wonderful musician and long-time river advocate, and the band is amazing. Since Laurie’s concert here sold out in 2011, and 2015 we’re urging everyone to buy tickets early so they get a chance to enjoy this special evening of traditional and original bluegrass music.” The event is co-sponsored with California Wilderness Coalition. In Mokelumne Hill, Laurie will be joined by frequent partner Tom Rozum, Patrick Sauber and Max Schwartz. Tom’s versatility and diverse musical influences come to the fore every night on stage with the band. He primarily plays mandolin in the group, but is also an accomplished fiddle, mandola, and guitar player. Tom’s background as a rock and swing musician adds a uniquely satisfying flavor to the band. He is a fine lead vocalist, the ideal harmony partner for Laurie. Patrick is a formidable talent on banjo, Cajun accordion, mandolin, and guitar. He has performed with the late Doc Watson, Herb Pedersen, Weird Al Yankovic, The Limeliters, Dirk Powell, and many others. Patrick has a keen ear, unusual musical depth and technical expertise and an encyclopedic knowledge of traditional music forms. Max, a Berkeley High School senior, is a rising star on the bluegrass banjo scene after playing for many years in his family’s bluegrass band, Oak Grove. At the tender age of 18, he understands the inner workings and sense of groove of a bluegrass band in a way that many older players have yet to master. 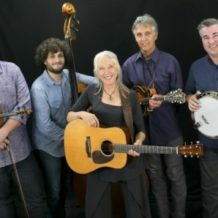 In Mokelumne Hill, Laurie and the Right Hands are likely to pay homage to such eminent influences as Woody Guthrie, Hazel Dickens, Grandpa Jones, and the inimitable Bill Monroe, as well as performing Laurie’s own compositions.